First catamaran across the line! The 3rd best catamaran performance in the history of the ARC. We were the 2nd over the line in the multihull class - beaten by a race rigged Neel trimaran with a pro racing skipper on board. Believe me when we say, we've spent hours during and after the race analyzing our strategy. Over the line, we were 7 hrs behind the Tri and just over 1 hr on corrected time. 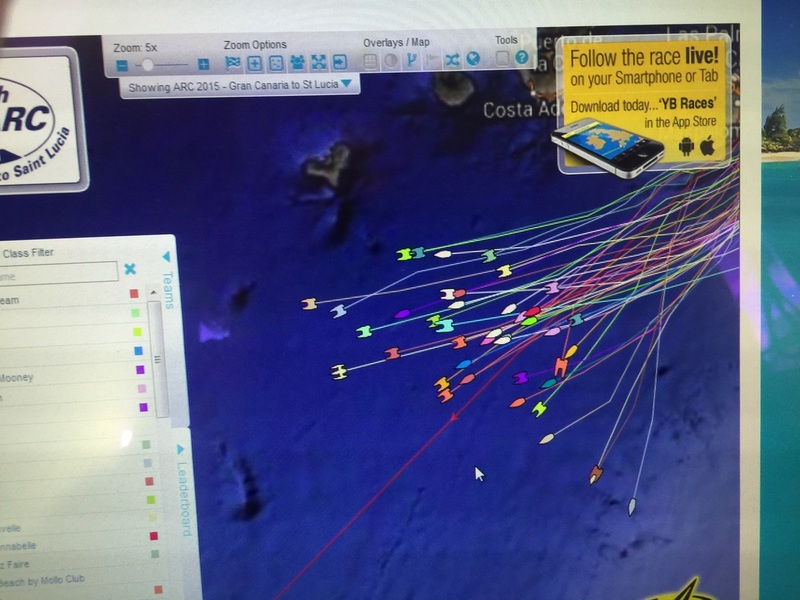 Distance & speed: 2760 nm in 13 days 18,5 hrs, a 200 nm per day average. We sailed at what can best be described as fast cruising speed. We did not do much downwind tacking and stayed within the stated limits of Outremer regarding wind speeds & sail plans. We did leave our spinnaker up overnight and flew it even in 10-25+kts of apparent wind. Our crew of 4 consisted of the two of us, Jan & Claudia, who have considerable miles, the owner who had very little catamaran experience and one enthusiastic recreational sailor. We found the ARC to be a well organized, professional event. If you love sun-downers and lots of parties, you'll love this event. The 'race' aspect of the ARC is very doable for cruisers and if you are a serious racer, you can really have fun on this course. The handicapping system is quite mysterious. Frankly we ignored it. Seems like a way to make slow boats feel good. We were 15th over the line in a total starting fleet of 198. There were many 60 -70 foot racing machines behind us. We started with 250l fuel and 240l water (4l/person/day) and made water as needed for regular showers and laundry . About 1/2 the tank capacity. We wanted to do well and knew that we had to keep her light. Sails used - note that this is a downwind rally. Snuffing the spinnaker in strong winds 'burned' holes in the spinnaker from the snuffers' sock collar on the second day - the vulnerability of our damaged spinnaker in a race with strong wind, meant nearly daily repairs, mostly with duct tape. It was time consuming and created a constant worry of losing our workhorse sail. The spinnaker also wrapped around the forestay and was torn at the top during a particularly fast & dark night when we overran the spinnaker and got a bit too far off the wind as we surfed at speeds steadily over 13kts. 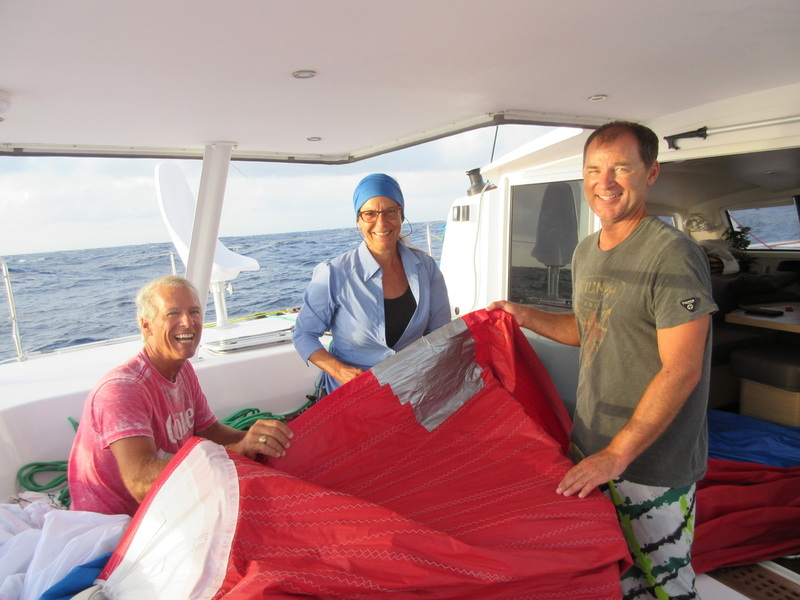 The turning block for the spinnaker sheets caused significant chafe damage to the gel coat. This is a 'lead' problem that was partially addressed by changing to a smaller rubber block. The spinnaker sheet leads need to be reworked. The spinnaker halyard chafed through. A by-product of there being a fixed spliced eye and running the spinnaker constantly for 5 days without being able to move the line. The two mainsheet blocks on the side of the boom were scratching boom so we stuck on patches to protect the boom . Emergency ladder was pulled out under speed. We lost 3 hrs when we a small bit of sargasso weed got stuck in our folding prop and created a pronounced shudder that increased as boat speed increased. At 1st light we stopped and dove on it to clear the debris. To our chagrin, this is a hazard of folding props. Our GoPro was a great tool for inspecting underwater issues. What a treat...on our crossing winds were slightly above average, with a low of 8 kts and a high of 40 kts. Most of the time we sailed in 12 to 25 kts of true wind. Squalls were few - two during the crossing and a batch just as we made the approach to St. Lucia. We did very little fishing as we were going too fast. The one day we did fish we had a huge strike that ran away with a lot of line. We finally saw what appeared to be a 100 lb tuna just before he broke the line. Solar panels kept up with consumption during the day, giving more then 20 amps at mid day. 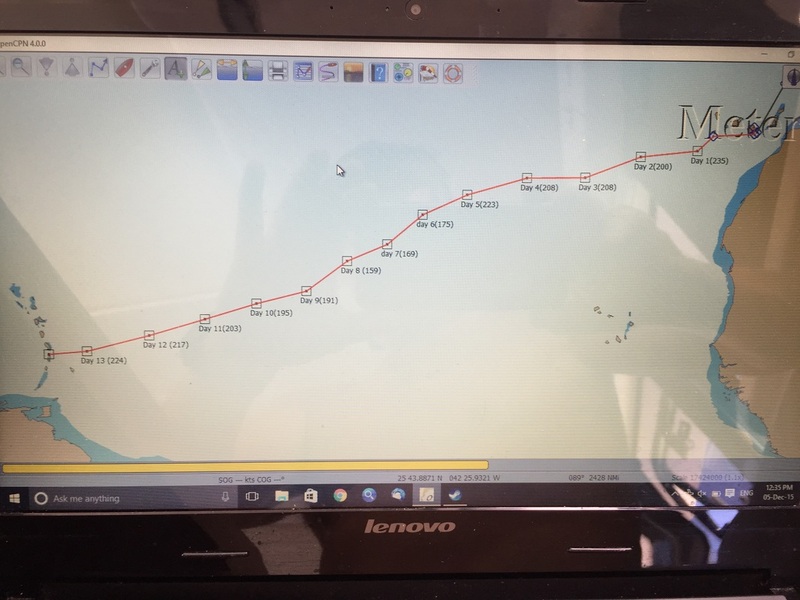 If we had run our Watt and Sea water generator we would not have had to charge much at all as at peak speed for the prop (10kts boat speed) we were getting up to 20 amps. We read that the water generator could slow us by as much as a ¼ knot so we chose not to use it but rather to burn fuel, lightening our weight and used the engines at 1500 rpm's with the prop disengaged for 4 hrs a day. Best fruit performance in rank order: Fuji & Pink Lady Apples, Oranges, Lemons, Kiwis, Persimmons. Favorite vegetable dishes - oven roasted cabbage & Imam Byaldi - roasted eggplant stuffed with tomatoes & onions & feta cheese (thanks Linda Morris Childress). Hanging citrus in a net in the cockpit did not work for us...it became very dried out, very quickly. Ratios that worked: 2 pieces of fruit per person, per day. 1/3 of a lb. of meat/chicken or fish per person per day. Equipment winners: Tefal non stick, nesting pots. Citrus reamer. Sacrificial cutting board for cutting rope/sheets etc. Frothing wand & espresso pot - let's face it, if you are going to race 24 hours a day for 13 days, you are going to need a latté. Designate one color microfiber cloths for floor clean ups to keep everyone from grabbing a cotton kitchen towels to mop up the floor. I say blue for the bottom -it seems to work. Did not lose one kitchen towel or tool to 'random reassignment' of galley stuff. We were a perfect team! Fantastic owner, David Walsh,...ready to learn & do everything he needed to become a confident and competent catamaran owner. Our regular crew member, Larry Roland, the most gregarious, congenial, helpful, relentlessly ready to pitch in, person you could hope to sail with. Jan Clusitra & Claudia Dengler, co-skippers, we love what we do and we hope it shows. We learned a lot about getting the best performance out of an Outremer and hope we have another chance to put our new skills to work. By nature & choice, we are not racing skippers but we sure had fun pushing ourselves and the boat to do our very best. Our every other day spinnaker repair. 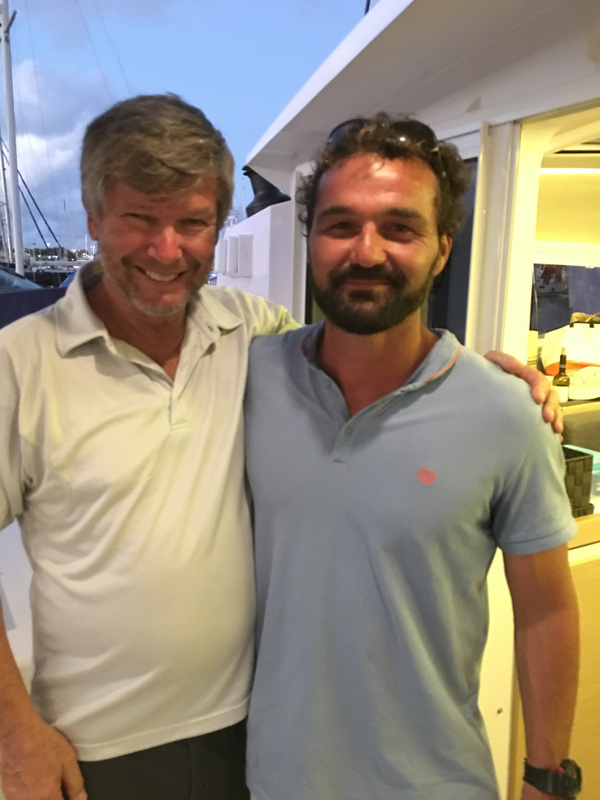 Jan, skipper of Wanderer & Fabian, the skipper of Caravelle - our primary & very worthy competitor. Caravelle is a specially built Neel 45' trimaran. The fleet picture, the trimaran Caravelle vs. Wanderer. Our actual route across the Atlantic.